SAVE THE UNICORN! A children's fantasy story to read online, print or download as an e-book. "Unicorn! Unicorn!" shouted Kia. "I've just seen a unicorn!" Everyone in the marketplace turned to stare at her. Her father, Jed the blacksmith, dropped his hammer in amazement. "A unicorn? Impossible! No-one's seen a unicorn round here in twenty years." "Well, I did!" insisted Kia. "It was down in the forest, by the pool." "Of course I'm sure! It had a horn as long as my arm. It was so beautiful!" sighed Kia. The unicorn had been standing quite still, gazing down into the water. It had looked like a statue carved from moonlight. "What's that? You found a unicorn?" At the booming voice behind her, Kia spun round. Sir Crabcut was striding across the market square. Sir Crabcut lived in the castle. He was as broad and impatient as a bull - a bull with ginger whiskers. They bristled fiercely when he spoke; or rather, when he bellowed. He only had one tone of voice, which was loud. Right now, his eyes were bulging with disbelief. "You?" he thundered. "You found a unicorn? A scruffy brat like you?" Kia dropped a curtsey. "Yes, indeed, sir," she said proudly. "Hmph! What did you do with it?" "I didn't do anything," said Kia. "I just crept away, so as not to frighten it." "What?" he roared. "You silly girl, why didn't you catch it? I could have added it to my collection!" Then, with a gasp of horror, she realised what he meant. Once, peeping through the castle window, she'd seen a host of glass eyes staring back. Animals' heads were ranged around the wall. There were stags, wild-eyed wolves, surly bears, and even a small, sad dragon. "Come to think of it," snorted Sir Crabcut, "a grubby little peasant-girl like you could never catch a unicorn. But it's just what I need for my collection! It'll look perfect over the fireplace." He turned and bellowed at the crowd. "Well, what are you waiting for, men? Fetch the horses! Get your weapons and saddle up! We're going hunting!" "What?" cried Kia. "You can't!" "I most certainly can. Jump to it!" snapped Sir Crabcut, and the crowd jumped to it and began to run for their horses. Kia caught at her father's arm. "You mustn't let him catch the unicorn!" she begged. The blacksmith scratched his head. "I don't like it, but how can we stop him? Sir Crabcut's our master. If we disobey him he'll clap us in chains." "Well, he's not my master," declared Kia. "If you can't save the unicorn, I will. I'll drive it away before he gets there. Can I borrow a horse?" "Sir Crabcut will take all the fast horses. But you can have old Molly, if you like. Be careful!" Kia hurried to the field where Molly the old grey mare was grazing, and scrambled up onto her back. "Run like the wind!" she urged. Molly could not run like the wind. She could trot like a gentle breeze. She was balding and scarred, and wheezy from many years of pulling carts, but she was always happy to carry Kia. Down to the woods she ambled, with Kia anxiously glancing over her shoulder. There was no sign of Sir Crabcut... yet. Inside the forest, all was still and silent. A carpet of leaves swallowed the sound of Molly's hooves. The trees reached out with long grasping fingers to pull Kia's hair and tug at her clothes: but she urged Molly on, until at last she saw a glimmer like a star caught in the black net of trees. She dismounted from Molly to creep closer. She hadn't been mistaken. There stood the unicorn, poised and graceful, by the pool. Kia caught her breath. She couldn't help murmuring, "Oh, it's lovely!" The unicorn looked up at her, then back at its reflection in the water. It tilted its head elegantly. "Yes, I am rather magnificent, aren't I?" it said. "Well, of course. All unicorns can talk. We're very clever beasts." "I've come to warn you!" said Kia. "You've got to leave!" she urged. "Leave now! Run away before Sir Crabcut comes to catch you." "Catch me? Really? I don't think so." "He wants to cut your head off and stick it on his wall!" The unicorn sniffed and tossed its silky mane. "Hah! No-one can catch me. We unicorns are far too clever to get caught." "Why, I could have caught you just now!" cried Kia. "You let me walk right up to you. I could catch you easily!" The unicorn looked down its sleek white nose at her. "No, you couldn't." "Couldn't," said the unicorn, glancing down again at its reflection with a complacent smile. Kia whipped off her cloak and threw it over the unicorn's head. As the unicorn wheeled and stamped, she held on tight. "See? I've caught you." "No, you haven't," said the cloak in a muffled voice. "I wasn't trying. You couldn't catch me if I was trying." Kia unwrapped her cloak. "All right," she said, with gritted teeth. "Start trying!" The unicorn galloped off around the pool. "Hah! You can't catch me now!" it whinnied. But Kia marched away in the other direction, under the trees. "Hey, unicorn! Here's a lovely fresh apple!" "Just here. Mmm, looks delicious!" Eagerly the unicorn trotted over. As it nosed at the apple, Kia dropped from her branch onto its back. Although it bucked and snorted, it couldn't throw her off. "See?" she panted. "I caught you again." "I let you catch me," retorted the unicorn sulkily. "I knew it was a trick. And don't hang on my horn like that: you might break it." "That's not a bad idea," she said, sliding off its back. "Without your horn, Sir Crabcut would think you were an ordinary horse. Then he'd leave you alone." But the unicorn squealed indignantly. "An ordinary horse? Moi? And how can you talk about breaking my beautiful horn? They never grow back, you know!" "Then there's nothing else for it. You've got to run away," said Kia firmly. "Sir Crabcut will be here soon with his men." The unicorn snorted. "I'm not scared. I can outwit anybody." "You can't even outwit me!" "Oh, you don't count. You're just a scrubby little girl," declared the unicorn. It munched up the apple and strolled away. Kia clenched her fists. She wanted to scream. None the less, she had vowed to save this unicorn, and that was what she would do - whether the unicorn liked it or not. But time was running out. Dusk was thickening beneath the trees. The moon was rising, so that a second, fragile moon shimmered in the pool. Kia was thinking hard. If she could only lure the unicorn over to her again, and somehow harness it, then she could lead it away. She began to pull long strands of ivy from the trees, and knotted them together to make a rope. Next, picking up an ash branch, she peeled away the bark until the wood was as smooth and pale as the unicorn's horn. Then she went to find Molly. "Molly! Here, girl!" she called softly. The old mare was grazing under the trees. When she trudged over, Kia held the branch against her scarred grey head and tied it carefully into position with some ivy. "There! How do you like being a unicorn?" Molly shook her head experimentally. The branch stayed in place. "Hmm. It isn't very realistic," decided Kia, "but then the unicorn isn't very bright. Now stand there, Molly, and don't move!" 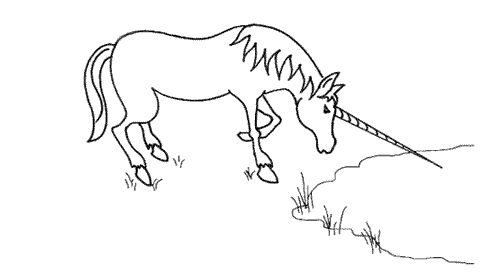 She arranged an ivy noose on the ground nearby, and ran off to find the unicorn. "Oh, do come and look," she called. "I've found another one!" "Another unicorn! It's over here. Just follow me!" The unicorn cantered after her. On seeing Molly, it threw back its head and whinnied joyfully. As it trotted forward, it placed a foot inside the ivy noose. At once Kia pulled it tight. "No, you didn't," said the unicorn, trying unsuccessfully to free its leg. "Didn't. I'm just about to get free. Any second now." Kia stopped. There was a crashing of branches, a clashing of swords, and a neighing of horses. "Any second now, you'll be dead!" she cried. "Quick! There's no time to run. Lie down!" "How dare you order me about?" huffed the unicorn. Kia tugged at the noose, and its legs shot up in the air. It landed on its side in the dead leaves, snorting indignantly. "I have never been so -" it began, before Kia threw her cloak over it. "Quiet!" she hissed. Swiftly she heaped armfuls of brown leaves over the cloak. By the time Sir Crabcut and his men rode into the clearing, she was standing innocently in front of a large pile of dead leaves. "Well?" roared Sir Crabcut. "Where's this unicorn, wretched child?" "I think it must have gone away," said Kia, hoping the unicorn would not try to stand up. She heard a faint shuffle from the heap of leaves. Sir Crabcut frowned. Dismounting from his horse, he strode forward, whiskers quivering. "What's that?" He drew his sword. "Look!" cried Jed the blacksmith. "Look! A unicorn!" And he pointed - not at the pile of rustling leaves, but in the other direction, towards the pool. There stood Molly, gazing down into the water. The moonlight painted her grey coat silver. From this distance, the ash stick strapped to her forehead shone as white and sharp as a horn. Then Molly raised her head, and slipped away into the trees. "After it! Catch it!" yelled Sir Crabcut. Leaping back on his horse, he set off in pursuit. The blacksmith and the other riders galloped after him. They hurtled around the pool and into the depths of the forest. Kia was alone. The unicorn rolled over and sat up, blowing at the leaves. "Hoo! Told you they wouldn't catch me!" it panted. "No," said Kia miserably. "They'll catch Molly instead. It won't take them long. She can't run very fast or very far. And then Sir Crabcut will be furious. He might kill her! And it's all your fault." She sat down in the dead leaves and burst into tears. After a few moments she felt something nudge against her legs. The unicorn had lain down beside her. It rested its head on her lap and looked up at her with glistening eyes. One huge silver tear rolled down its face. "Oh, my," said Kia, and she used her cloak to wipe first the unicorn's face and then her own. "It's not really your fault," she whispered, sniffing. "It's my fault, for telling Sir Crabcut about you in the first place. I wish I'd never said a word." "I don't want Molly to get killed," wailed the unicorn. "I'll go and give myself up right now." It began to lurch to its feet. "No, you mustn't. Stop!" For Kia could hear the rumble of returning hooves. She pushed the protesting unicorn back down into the leaves and covered it up again. Then she hurried forward to meet the horsemen cantering back through the twilight. Sir Crabcut held Molly's reins in his hairy fist. Furiously he dragged the horse into the moonlit clearing. She was wheezing dreadfully and limping. The ash stick dangled from her shoulders in a tangle of ivy. Sir Crabcut seized the stick and waved it at Kia. "What do you know about this, then, eh?" he bellowed. Kia gazed up at him, biting her lip. She did not know what to say. It was her father Jed who answered. "It's nothing to do with her! You can see she's as surprised as the rest of us. It's just somebody's idea of a joke. It fooled us all." "Hmph!" growled Sir Crabcut. "Silly little girl, who can't tell the difference between a unicorn and a carthorse!" "I - I'm very sorry, sir," said Kia. "I might have known it was a waste of time," he grunted. "There are no unicorns round here any more. It's twenty years since I last saw a unicorn in this forest - and I would have caught it, too, if its horn hadn't broken off in my trap and let it get away." "Well, I expect it must have told the other unicorns," suggested Kia, "and they were all too scared of you to ever come back." "Hmph! Scared of me? Yes, that's very likely." Sir Crabcut twirled his ginger moustache. Kia put her hand on Molly's back. She could feel the old mare's flanks heaving breathlessly. "Are you going to chop off Molly's head?" "What would I want with an old horse's head on my wall? It would look very vulgar. I only collect rare and special animals." "I hear somebody spotted a griffin the other week," said Jed the blacksmith casually. Sir Crabcut's eyes brightened. "A griffin? Where?" "Oh, miles away. Too far for you to go." "It's never too far for a griffin! Now that would look good on my wall! I'll have to set up an expedition." Sir Crabcut let go of Molly at last. "Well, come on, men! Enough dawdling. I want my dinner." He set off at a canter towards the castle. His tired men trooped after him. Only the blacksmith stayed behind. "A griffin should keep him busy for a while," he chuckled. "I hope so. I was so worried about Molly!" Kia threw her arms around the old mare's neck and hugged her. "Brave girl, leading them away like that! It's just as well Sir Crabcut's even more stupid than the unicorn." "Who are you calling stupid?" The unicorn rose up haughtily. A rustling drift of leaves fell from its back. "Well, fancy thinking Molly's horn was real!" said Kia. "Do you think I don't know another unicorn when I see one?" It walked gracefully over to Molly and nuzzled against her shoulder. "Oh, honestly! Couldn't you see it was only..."
Kia paused. Slowly she reached up and stroked Molly's grey head. It was growing too dark to see clearly, but her fingers felt a hard, round scar right in the middle of Molly's forehead. "Dad?" she whispered. "Where did we get Molly?" Jed shrugged. "I don't know where she came from. She just wandered into our field one day, when I was a boy, twenty years ago. Now, what are we going to do with this unicorn?" "You're not doing anything with me." The unicorn stamped impatiently. "I'm taking Molly home." The old horse sighed. Then, in a cracked, husky voice that had not been used for years, Molly wheezed, "I tried to go home... but I forgot the way." "Oh, poor Molly!" Really, Kia thought, stroking her ragged mane, unicorns weren't very bright at all. "Then it's lucky that I know the right path," said the unicorn. "I'll show you now. Come on!" Kia stood back with her father and watched the pair of them prance around the pool. Molly followed the younger unicorn eagerly, tossing her stiff old head in joy. The moonlight bathed them both in liquid silver. Shining like a pair of stars, they trotted away beneath the trees. Slowly the light faded until it was no more than a glimmer in the dusk. Download the ebook of SAVE THE UNICORN!